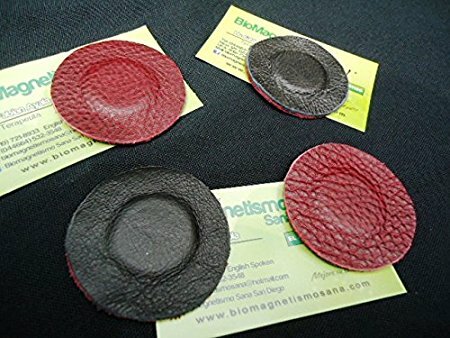 Leather Covered Magnets for Biomagnetic therapy available now and accesible to everybody through Amazon. This great idea of covering the therapy magnets is not new, but was not available for sale on the internet until now. There are simple starter kits that you can purchase for less than $100 dlls. which make it very accesible to anyone who wants to practice and learn about the benefits of this amazing new therapy that is growing exponentially worldwide. The characteristics of leather as so many people may know are flexibility, and softness besides preserving the good state of the magnet itself from accidental drops. The softness of the leather covered magnets feel more friendly to the touch and placement in the different parts of the body that you will like to place them, without loosing any of its gauss power. 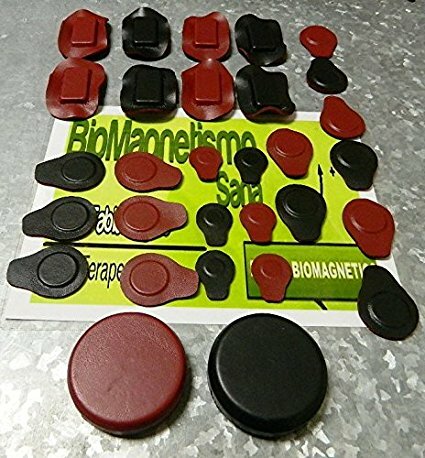 This extensive leather covered magnet kit will make a great set consisting of 15 pairs of magnets of different sizes. ONE PAIR OF ONE POLARITY MAGNETS WITH CENTER INDUCTOR. Polarity is as follows: black is negative (-) Red is positive (+). 4. RASTREO BIOMAGNETICO COMPLETO (15 PAGES) AND 3 VIDEOS (SPANISH) ( over 8 hours of wonderful information) : PART 1: THEORY AND EXPLANATION PART 2: PRACTICE (TRACK) PART 3: EXPLANATION HOW TO TRACK THE BODY. The bonus gift detailed above is worth most of the price of the magnets! This will make a great start to learning and practicing this wonderful non-invasive technique developed and researched by Dr. Isaac Goiz Durán. You can find more information about him in here. We do not know how long this offer will last, so we encourage you to take action and order these products from Amazon.